You are paying entirely too much on heating bills. You have read all of the advice and know that you should undertake whole-house wall insulation, but it seems like too much work. Guess what? It is. Wall insulation is valuable and necessary, but it is also a huge job when done after wallboard has been installed. There are two ways to do this, from the inside or the outside. On the inside, you can pull out walls in order to install roll insulation. On the outside, you can create holes in the siding to inject loose insulation. Both methods are expensive and invasive. As an intermediary measure, install attic insulation throughout the house. ​You can do it yourself. 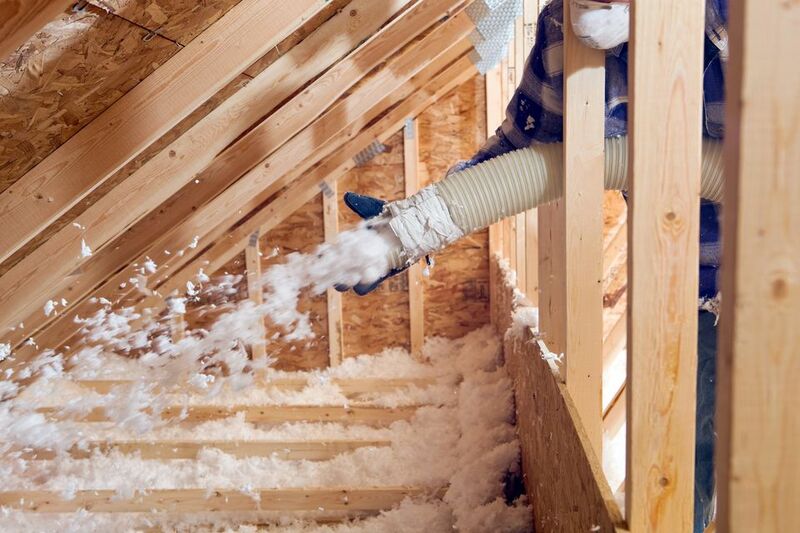 While not an easy or fun project, you can insulate your attic by yourself. The worst part is getting the fiberglass batts up into the attic. Once the batts are up there, it is a tedious task of laying the batts between ceiling joists. Wires, vents, and non-IC recessed lights complicate the task. Heat rises. By putting a secure, heat-impermeable "lid" on your living spaces, you slow the migration of heat through your ceiling and attic. Lack the patience to do a detailed attic insulation job, complete with spray foam around vent and wire entry points, caulking, and spot insulation? No need to worry. While a complete job is best, a strong second best is simply to get those batts up in the attic and lay them between joists. EnergyStar, the official organ of caution, says that homeowners should not "worry about finding and sealing all the little holes in your attic; your biggest savings will come from plugging the large ones." EnergyStar advises that the correct type of installation for most attics is R 38 or enough insulation to cover about 10 to 14 inches deep. Vapor Barrier Up or Down? Experts say that if you are putting in a second layer of insulation, you should have no vapor barrier between the two layers. So, for this top layer, you would be purchasing unfaced insulation batts (not rolls) of an R-value of at least 30. If the batts are your only layer, you should install them with the vapor barrier down--facing your living area below. In this case, use R-38 insulation, as recommended above by EnergyStar. What If You Find Asbestos in Your Attic? You have made the bold decision to insulate your attic. Then you go up there and find what appears to be asbestos. If the fill is soft and gray, it is probably paper-derived insulation called cellulose. If it is white and fluffy, it likely is loose-fill fiberglass insulation. But if this fill is hard, lightweight pellets with a "mica-like" shine, it's probably an older form of insulation called Zonolite. Zonolite may contain asbestos. Zonolite presents a health danger only because it was contaminated with tremolite, an asbestos-like mineral.